Get kids cooking without the fear of a hot stove or open flame with the first-ever kids’ slow cooker cookbook. 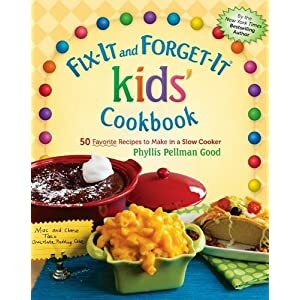 Fix-It and Forget-It Kids’ Cookbook: 50 Favorite Recipes to Make in a Slow Cooker by Phyllis Pellman Good offers kids the direction and encouragement they need to prepare easy-to-make, tasty meals—everything from main courses to snacks and even desserts! With recipes such as Pizza Dip, Party Meatball Subs and Gooey Chocolate Pudding Cake, the budding chef in your household will be back in the kitchen cooking up a storm.